Throughout this holiday season, I've posted photos of Christmas decorations all over Disneyland, except from two locations: Mickey's Toontown and Critter Country. Well, unfortunately, I never quite made it to Toontown, but I did make it to Critter Country a couple of weeks ago, and I used the opportunity to snap a few nighttime shots in front of Splash Mountain. This area of the park is so peaceful and secluded (outside of the screams coming from the Briar Patch, of course! ), it's easy to see it sliding into its rustic holiday mood. The beauty and peace of nature go hand in hand with the joyous message of the holiday season, and at the end of the night, this is especially noticeable. 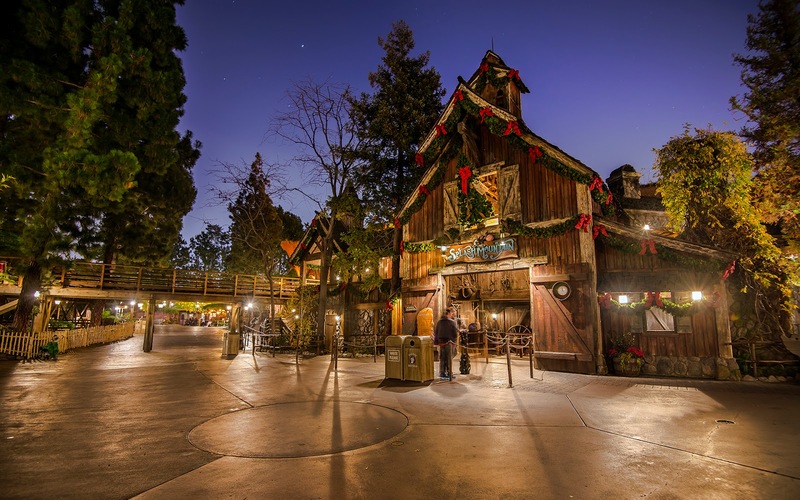 Splash Mountain at night, decked in woodsy garland for the holidays.